The Dallas Screenwriters Association (DSA) had their inaugural ScriptsLIVE! 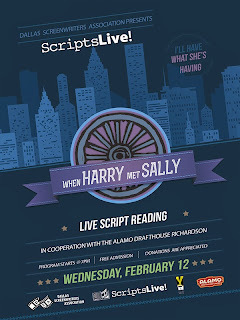 event February 12 which was hosted by the Alamo Drafthouse. 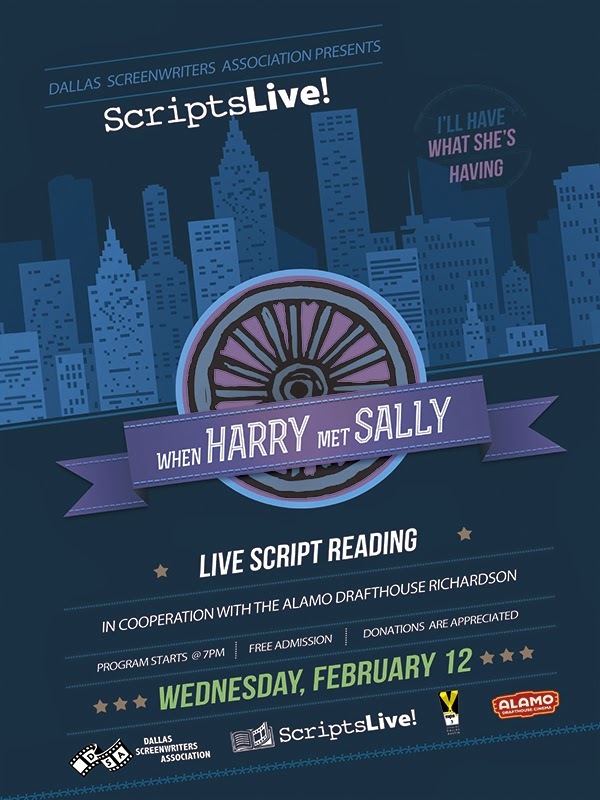 Ivan and Jason Reitman's concept of live readings of a movie script using famous actors was the inspiration for the concept that will be performed at the Alamo Drafthouse in Richardson on the second Wednesday of every other month. We may not be able to see the big names that Hollywood can provide, but Dallas has a large stable of talented actors as the ones that read When Harry Met Sally at this first event. A truly great movie is only as good as the written word. No matter how competent the actors and director or even having exquisite art direction will not save a movie if the dialogue and storyline is weak. The best way to show off a screenplay is to read it out loud. Writer Nora Ephron had created a quirky romantic tale of two opposite characters who find love a decade after first meeting and disliking each other. Last night's reading was from the movie script and was without the Billy Crystal adlibs and Rob Reiner's direction that made the final 1989 film. But the script stands on it's own. It was read by Cooper Harris as Sally, Spencer Harlan as Harry, Sarah Adams as Marie, Adam Litwin as Jess, Giovannie Cruz and Chase Austin as secondary roles, and Elizabeth Dukes Melancon and Troy Randal Smith as the assorted other characters. They brought the story alive with their enthusiastic performances which they enhanced by endearing looks to each other, small hand gestures and even a stadium style wave. It was also supported with pictures from the movie flashing behind them. Considering this is the first effort, the small technical problems will hopefully be ironed out for the next event. The sound could have been better. There was lots of microphone feedback, and if you were eating noisy food it was hard to hear. Plus the pictures could have been more frequent and better timed with the story. Overall, it was entertaining and enjoyable and worth coming back. Mark your calendars for the upcoming schedule!